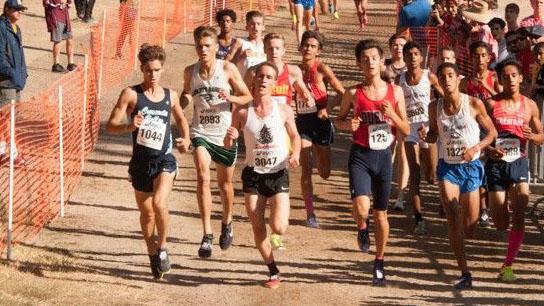 Liam Anderson (center in white) and Matt Strangio (directly behind Anderson in red) are two of the top boys distance runners in the U.S. and are expected to battle Saturday at the Clovis Invitational, as they did last October with Anderson placing second and Strangio fifth. (Pat Rhames photo). NOTE: This post was updated 10/4 at 4 p.m. to correct information about the boys course record holder. The 40th Asics Clovis Invitational will be held Saturday at Woodward Park in Fresno. The undulating 5,000-meter course used for this meet is the same course that has been used for the State Championships since the CIF added cross country finals in 1987. "Clovis brings together a lot of the top teams in the state in one race on the state meet course," wrote Great Oak coach Doug Soles in a text. "(The meet) gives coaches a great metric for what they can expect at State." So, the majority of the state's top teams and athletes competing on the state championship course seven weeks before those same CIF-State finals. OK. Sounds like super-fast competitive fun. The 16-race schedule begins at 7:15 a.m. with elite "Championship" races for top girls and boys individuals and teams set for 8:55 a.m. and 9:30 a.m., respectively. Of the many storylines among the elites expected to compete, the boys headliner is the expected season debut of Larkspur Redwood senior Liam Anderson and the probable challenge of Carmichael Jesuit junior Matt Strangio. Anderson, a senior at Redwood (NC), who committed to Stanford this week, is the defending CIF-State Division III champion who was an impressive third at Nike Cross Nationals last December. Anderson, who is also the State 1,600-meter champion on the track, was ranked as high as No. 1 in the U.S. in the MileSplit50 rankings. He was second at this meet last October behind El Camino Real's Justin Hazell (now at the University of Portland) running his 5K PR of 15:03.00. As a sophomore, he was 17th, running 15:42.60. Strangio, a junior, has been slowed by injury in recent weeks, forcing him to miss last week's Stanford Invitational. Strangio, the State 3,200-meter champion on the track, was fifth here last year in 15:16.70. As a freshman, he was 21st, running 15:46.30. If fully healthy, the much taller and lankier Strangio should give Anderson the type of push necessary for both runners to threaten sub-15s. There have only been seven under 15 on Woodward's 5K layout at the Invitational in the last decade. German Fernandez of Riverbank (SJ) set the course record of 14:24 at the 2007 State Championships and Luis Grijalva of Armijo (SJ) has the fastest time at the Invite in the last decade, running 14:49.90 in 2016. The potential for additions to that exclusive club are heightened by the fact that, take Anderson and Strangio out of this field, and the boys Championship race lineup is still loaded! Sub-15 loaded? Hmmm? That's why they take the line. Marcus Mota, Ivan Mendez and Preston Norris are among individuals entered along with elite teams to include four-time team champion Great Oak, Strangio's Jesuit crew, Amador Valley, Dana Hills, JSerra, Newbury Park, Mountain View St. Francis, Palos Verdes, and West Ranch among them. Norris, a senior from Las Lomas (NC), has won at Monte Vista, Lowell and De La Salle so far in 2018, setting two distance-specific PRs along the way. He ran his 5K PR of 15:37.80 here last year for third in the Varsity Boys Medium School race. Newbury Park includes Woodbridge winner Nico Young; Dana Hills includes Simon Fuller (who won the DH Invitiational), plus Cole Stark and Carrick Denker, who placed top-seven overall last weekend at McQuaid in New York; JSerra is led by defending State D-IV champion Anthony Grover, a junior, and senior Peter Herold. 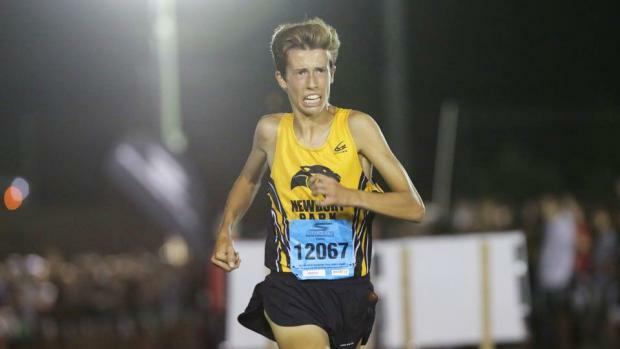 Newbury Park's Young, a junior, posted the fastest 3--mile time in the country so far in 2018 with his 14:01.10 sprint at SilverLakes in Norco in the meet they call Woodbridge. Mota was third there in 14:05.40 with Dublin's Loic Scomparin fourth in 14:07.10. That meet produced nine of the top 10 fastest 3-mile times in the U.S. so far in 2018. The West Ranch senior duo of Evan Bates and Isaiah Seidman just ran the fastest two 5Ks of 2018 when they went 15:02.20 and 15:08.20, respectively, at last Saturday's Master's College Mustang Challenge. 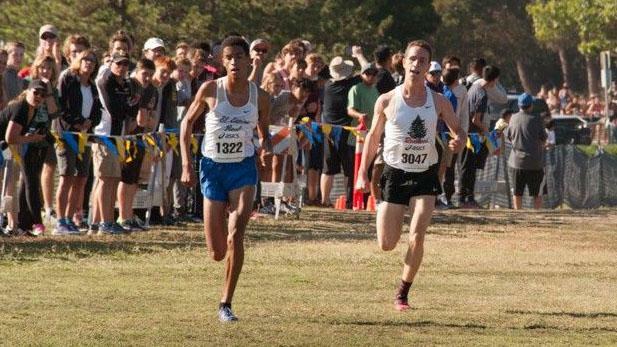 Also at Master's, West Ranch sophomore Dylan Gatua ran 15:17.70, the No. 8 time in the state. This field is also expected to include a couple of others currently in the state's 5K top-10: Clovis North junior Isaiah Galindo (15:15.20 from Stanford) and Mountain View St. Francis senior Colton Colonna (15:21.50 from Stanford). Perennial State meet champion Great Oak, has won the elite boys and girls titles here four years in a row. "As a team we are shooting to break the girls course record and the boys are shooting for the meet record," Soles wrote. The boys, coming off a team victory at the Bob Firman Invitational two weeks ago in Idaho and ranked No. 2 in the U.S. in the MileSplit50 XC Boys Team Rankings, are eyeing the 2010 meet record of 77:09 set by Arcadia, which went on to win the national title, Soles wrote.